Kim Stanley Robinson's Mars Trilogy is one of the greatest achievements in science fiction. Maybe this is an exaggeration, maybe I'll change my mind when I get to Blue Mars, or maybe I don't know what I'm talking about. Whatever. Robinson produced something great here: a blend of hard SF, literary writing, intricate world building, and deep philosophical ruminations on ecology, science, politics, and humanity's potential. This is what might happen if Greg Bear, Frank Herbert, and Ursula Le Guin collaborated. I understand why some people don't like these books. They can be slow. There's not always much action. There are large blocks of text, sometimes several pages long, consisting of elaborate scientific details and descriptions of the Martian landscape. Even worse, there are similar blocks of text on philosophy and politics (including several discussions of Thomas Kuhn, which warmed my philosophy of science loving heart - more on that later). But if you're like me and you read science fiction for the ideas and don't cling dogmatically to the show-don't-tell rule, you may also love this series. The plot follows the struggles of Mars to become independent from Earth. Along the way we get Robinson's tremendous world building (those scenes where the characters drive around Mars and think about things have a point!). Every five or ten pages Robinson produces a moment of literary beauty and philosophical depth. There are even a few humorous moments, which often involve the character, Coyote, who lives up to his trickster namesake. "One dawn the deep plum color of the sky illuminated the spectacular fin ridge of the Acheron to the north, looming like a Manhattan of solid rock, as yet uncut into individual skyscrapers" (p. 300). "It had been a frustration to both of them, and when Ann cried out that he had never seen Mars, a statement that was obviously false on some levels, she had perhaps meant only to say that he hadn't seen her Mars, the Mars created by her paradigm. And that was no doubt true." (p. 190). "'... Hiroko only listens to me when I say things she wants to hear.' He cackled. 'Same as with everyone, right?'" (p. 34). I read Red Mars about twelve years ago. 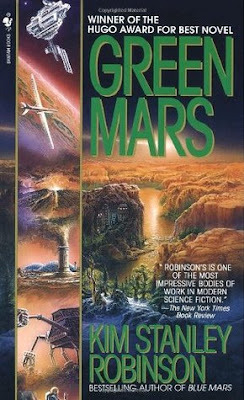 I liked it, but I don't remember loving it as much as I loved reading Green Mars recently. Maybe my tastes evolved (I've been reading and loving Robinson's work lately, especially 2312 and Shaman, and I'm super excited about his new one, Aurora). Or maybe it just took me until the second book to understand Robinson's ambition. Robinson's genius in this series is this: he recognizes that human colonization of Mars will not be a simple matter of us changing Mars to be another Earth, but of Mars changing us. We will not terraform Mars so much as Mars will areoform us. Many science fiction writers forget that space exploration and the advancement of scientific knowledge are not merely matters of static humanity affecting a changing universe; it is in fact precisely the opposite: a relatively static universe alters the course of humanity. Perhaps we need Robinson's ecological imagination to see this. Robinson illustrates this idea best with the humans born on Mars, who are both physiologically and philosophically different than the colonizers. Genius that he is, Robinson uses the remaining First Hundred, who are still alive due to longevity treatments, as a way to dramatize these differences. It also gives a nice link to the first book, since the second one picks up over 40 years after the first one ends. I love that the characters with longevity treatments still have memory problems despite their younger bodies; I had trouble remembering the details of Red Mars, which I only read twelve years ago, so I can imagine how hard it would be for them to remember events that took place a century earlier! Robinson has a lot to say about humanity, ecology, politics, economics, etc. The conference aimed at creating the political structure for a free Mars consisting of diverse groups is fascinating (how to organize anarchists, pro-terraformers, anti-terraformers, and conservative religious groups?). Also fascinating are the enacting of gift economies and the drama surrounding giant powerful corporations (transnats and metanats). Given my own interests in epistemology and philosophy of science, I was particularly interested in the relation between humans and their environment that I mentioned earlier. You might call Robinson's idea ecological epistemology. Rather than thinking of human knowers as standing apart from their environments in a one way flow of information from world to knower, Robinson shows that knowers are part of their environments - the influence goes both ways. Those discussions of Thomas Kuhn that I mentioned earlier happen when a character, Sax, is denigrating social science, in which we try to know ourselves, as opposed to natural science, in which we know nature. Later Sax comes to realize that natural science, just as much as social science, involves an interdependent ecology of knower and world (and of course paradigms and interpretation of data). So of course colonization of Mars and the pursuit of scientific knowledge into the 22nd century would change the environment, but Robinson's ecological epistemology invites us to consider the ways in which our activities and the pursuit of knowledge would change us as well. I'm excited to witness the continued areoformation of humanity in Blue Mars, which I plan to read much sooner than twelve years from now!